Bill Yuill, shown here at the Margery E. Yuill Cancer Centre, is committed to improving the cancer experience for patients. Photograph by Wes Bell. When Bill Yuill’s grandfather settled in Medicine Hat in the 1880s, there wasn’t much of a town to settle into — he had to help make one. “Back then, folks would get together with friends and neighbours to try and build a town and a community,” Yuill says. That entrepeurial attitude has stayed in the family for generations, and continues to shape Yuill’s own desire to work with local causes. Through the Yuill Family Foundation, Bill Yuill and his family support a variety of causes in Medicine Hat, including education, youth sports, and cancer care and research. 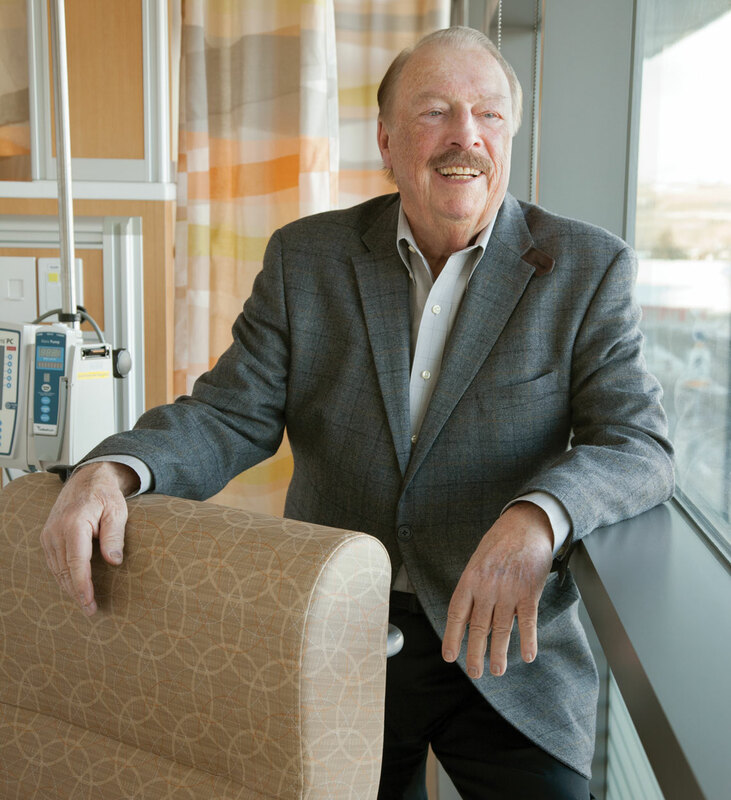 In 2011, their foundation committed $2 million to the Alberta Cancer Foundation in honour of Yuill’s mother, for whom the Margery E. Yuill Cancer Centre is now named. Margery Yuill, a nurse and volunteer, died of pancreatic cancer in 1965. Yuill remembers her as a kind person — the sort of low-profile, community-building mom who might not always stand out in a region where prominent men dominate the spotlight. “I just thought it was appropriate to name [the cancer centre] after her,” he says. Two years after that generous donation, the Yuill Family Foundation announced it would match proceeds raised by the Royal LePage Breast Cancer Golf Classic. The annual tournament, which takes place at the Medicine Hat Golf & Country Club, supports the Margery E. Yuill Cancer Centre. The 22nd annual golf tournament in July 2018 raised a total of $77,100 (including the Yuill Family Foundation’s matching donation), funds that will be used to help improve the treatment experience for cancer patients at the Margery E. Yuill Cancer Centre. For Yuill, the decision to commit to this matching annual donation was a straightforward one. He has been involved with the golf tournament as a participant and informal advisor since his friend Debra Cantalini-Gallant founded the event 23 years ago. The late Cantalini-Gallant was a breast cancer survivor and a tireless fundraiser for breast cancer research and treatment. After she died in 2013, Yuill thought it would be a fitting tribute to support the tournament that had meant so much to her. In fact, the Royal LePage Breast Cancer Golf Classic is important to the entire town. Yuill describes it as one of Medicine Hat’s major summer events, a well-run community tradition that unites participants, local businesses, volunteers and supporters. The tournament directly affects the lives of many local people. For Yuill, it’s rewarding to know that his family’s contributions are helping the people of Medicine Hat and the surrounding region access excellent care without having to travel to Calgary or Edmonton. He’s glad the Margery E. Yuill Cancer Centre makes it possible for people to stay close to their families and friends. For him, it’s part of the community-building work that his family has always done.